Swindon Supermarine Football Club is delighted to announce the signing of goalkeeper Martin Horsell from National League North side Hereford FC today. Martin left Hereford by mutual consent a couple of weeks ago and with a number of clubs interested in signing him, including one that is sitting in the top three in our league, manager Lee Spalding is very pleased he decided to join us at Marine. Having started his career as a Youth player at Plymouth Argyle he has spent the last eight seasons with only two clubs. From 2010 to 2015 he was with fellow leaguers Weymouth and then from 2015 to 2019 he was with Hereford, where he won three promotions, the latest last season as Southern League Premier Division champions. Manager Lee Spalding said earlier today: “We are delighted to have signed Martin, his previous club being Hereford since 2015 to 2019, he gained three promotions with them”. 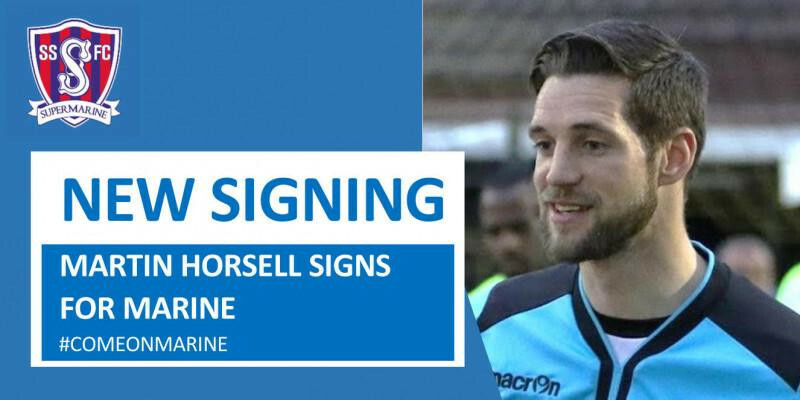 “He will bring great experience and quality to the team and is another player who has played at a higher level which will be important as we look to continue to build a team that will look to push for promotion over the coming seasons”. “Yet again, I believe Martin’s signing says a lot about our club and especially the ambitions of the Chairman and Directors who have supported me all the way in making another important signing”. “Welcome to Marine Martin”.